Modern kitchen cupboards are all about minimalism. Whether you have a large kitchen space for Kitchen Units, or you are living in a London studio apartment, and you really have to pack a lot of stuff in tiny cupboards, it is always good to try smart storage solutions. 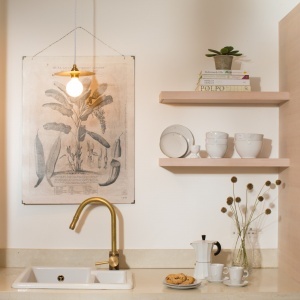 Built in kitchen drawers design are the talk of the town, but if you are looking for practical and easy solutions, here are a bunch of tricks and cabinetry solutions to set you on the right path. Almost all modern kitchen cupboards designs have a pantry, and you can save a lot of space in the kitchen by optimising the utility of that pantry. Make sure that all the cereals and spices are in rotation so that you do not have to deal with clutter. If you have a larger space a kitchen island is a great utilisation of extra work top surface with the extra storage facility below. It is a great area for preparing food, eating breakfast with the addition of breakfast bar stools and can also be perfect area for entertaining guests. It is important not to let any space go to waste in a small kitchen, which is why overhead kitchen cupboards are an essential storage solution. Don’t let the tops of these cabinets go to waste. Use baskets to stow extra pantry supplies up there. You can always retrieve them by standing on the chair, and that extra storage saves a lot of space. A small kitchen is no place for a normal-sized breakfast table. Try space-savvy furniture options. It could be folding furniture that completely merges with built in cupboards designs or an accurately sized table which perfectly fits into a tight space. If you have built-in cupboards designs in mind, and if you would like a dicing station which can be completely hidden away, then a nesting table is an amazing choice. It occupies a minimal amount of space, and you can push it into the shelf like a drawer when not in use. It is solutions like this which merge utility with versatility. You don’t have to miss out on any kitchen facilities on account of a small size! So, we have taken into account the utility of spaces above cabinets. The same principle applies here. Fit a cabinet unit in the space above the fridge, for example this is a perfect space for installing a metal wine rack and you will be thanking us for this grand idea. It saves space and adds storage. Want to save more space? You can also add a sliding shelf between the fridge and the cabinet. A Shelving unit of that scale can act as a secondary pantry to store all the jars and spices. Small-space dwellers are always looking for ways to add more storage and maximize the utility of every nook and cranny of their accommodation. Though our bedrooms and living rooms have great space-savvy features, our kitchens often fall short. If you abhor clutter, and if you want your kitchen to make a great impression, then follow these amazing storage solutions. We suggest our range of rustic wooden kitchens with great storage design.